Map of Ag is a global pioneer in agricultural analysis and modelling technology. We provide expert knowledge and insight to agriculture and food chain industries from our offices in the UK, Argentina and New Zealand. Providing access to intelligently sourced data and information from farms, we enable businesses within the agriculture industry and food chain to maximise the impact of planning and decision-making. Map of Ag enables you to generate insight and gain knowledge of industry trends by talking directly to farmers and, more specifically, to address targeted questions which are relevant to your business. By working closely with farmers, we are able to gather valuable data, insights and opinions that benefit the agricultural industry as a whole. Map of Ag has long-standing relationships with companies involved in every aspect of the food chain. Our research arm, the National Farm Research Unit (NFRU) has been at the forefront of agricultural market research since 1994. 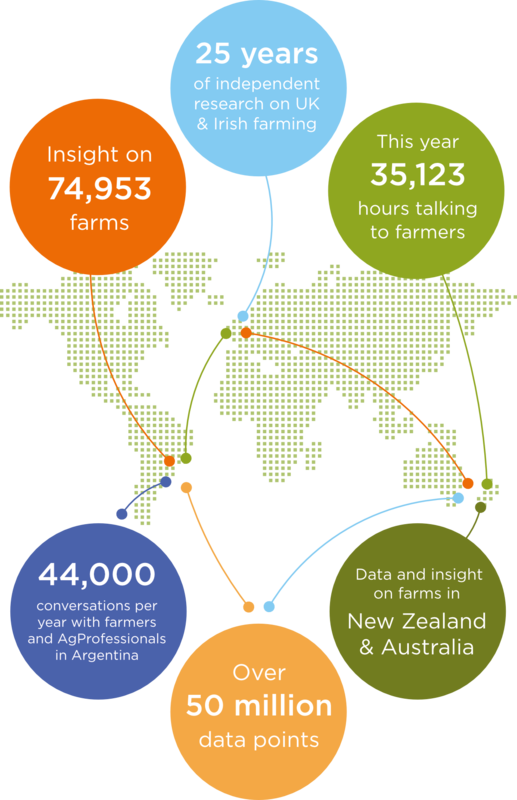 During this time, we have conversed with tens of thousands of farmers about topics that matter. Our research studies enable us to gather information and build a detailed picture on farming issues and trends. If you would like to know more or are interested in having your views and opinions heard, please select your country below. The Map of Ag Platform provides easy and intuitive access for farmers to log in and set up permissioned access to their data sources. This secure real-time automation of everyday information gives comprehensive and valuable insights. Map of Ag successfully combines the disciplines of quantitative and qualitative research, marketing services and strategic consultancy. We provide market insight, competitive advantage and customer differentiation to a range of organisations, both in the public and private sectors.